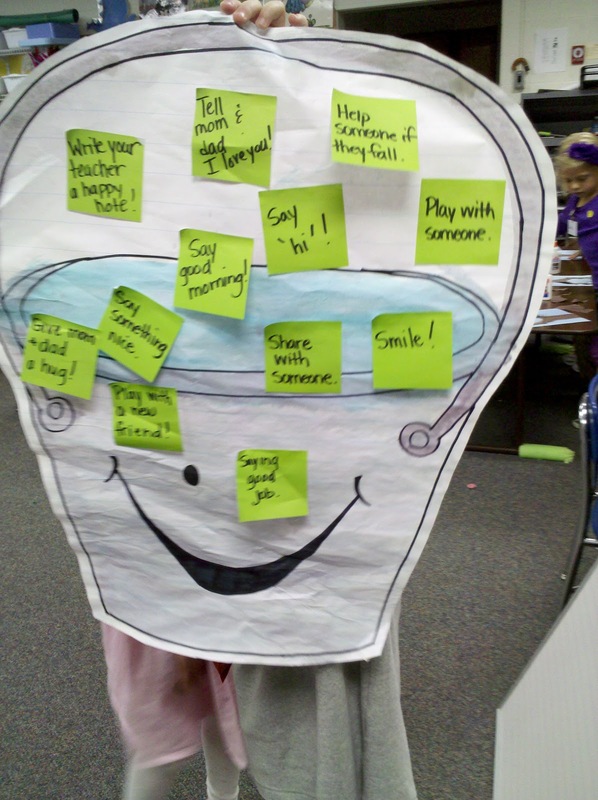 I'm here to share a fun lesson and positive behavior idea with you. Last week we watched a video of the book Have You Filled A Bucket Today?. I found it on YouTube. After we watched the video the kiddo's brainstormed ways to fill someone's bucket. We talked about how filling a bucket does not cost any money, etc. As the children gave examples I wrote them on green post-it notes. They placed them on a giant bucket that I had drawn and painted. We also talked about being a "bucket dipper"...those not so nice actions and words that hurt others. I wrote those onto blue post-it notes. As we wrote a 'dipper' the child crumbled it up and threw it in the garbage can! They loved this activity! The children all agreed to be 'bucket fillers'! To encourage this behavior, as the children are seen being a 'bucket filler' they will get to add a shiny plastic coin to their classroom bucket. If another child sees someone being a 'bucket filler' they can add a coin as well. When the class has 100 coins we will have a popcorn party. This is a simple, fun and empowering activity that encourages being kind to others! There is a fun new blog on the block! A group of great Kindergarten bloggers has united together to write a collaborative blog titled "Top Teacher's Kinderland". It also includes some great freebies!! Be sure to stop over and check it out!! Now for a freebie... I have finished a new collection of colored clip art. It is a set of 50 football and cheerleaders in seven colors. I am offering one 'team' as a freebie. It is available now in my TPT store.